The Los Angeles Kings stand eight points out of a wildcard spot in the Western Conference. Furthermore, with six teams to jump in the standings, the Kings are sellers this trade deadline. Rob Blake deals from a position of modest strength this trade deadline. Some feel Los Angeles can get younger and alleviate their cap issues. Los Angeles sees themselves as unabashed sellers. The Kings traded Jake Muzzin for a solid return already and made a minor trade on Monday. At some point, the general manager faces the specter of the salary cap. Los Angeles finds itself under the salary cap by $7.183 million. Now come the deadline, those dollars translate to approximately $9.87 million. Their SPC (Standard Player Contracts) drops to 45 after the Nate Thompson deal. Thompson traded to Montreal was not a surprise. Los Angeles also traded Minnesota’s fifth-round pick to obtain Montreal’s fourth-round pick. Blake continues to sell pieces to round his roster out. This sets up well for the summer (draft/free agency) and next season. In the meantime, Blake ponders more pieces to sell for the right price. Who else could go? Let’s take a peak. Tyler Toffoli — The forward comes at a price as far as cap hit ($4.6 million). Another year remains on the contract. Also, Toffoli is just 26 and having a down season. Maybe, a change of scenery helps. He possesses nice relative metrics at +6.2% but no luck with a 7.1% shooting percentage. The power-play numbers disappoint many as he has just two goals. That’s it! Chances and shots per game are about the same as last year and in line career-wise. Toffoli likely does not cost a team a first-round pick. Ilya Kovalchuk — Kovalchuk could provide an uptick in secondary scoring. His relative possession compared to the team is -3.5% at even strength. His cap hit stands at $6.25 million for two more years. One bad detail is Kovalchuk possesses a no-movement clause. Essentially, he can say no to any move. Los Angeles would have to get the forward to waive it first. He tallied three power-play goals plus five power-play assists thru 45 games. Some team may gamble if Los Angeles was willing to retain some salary. 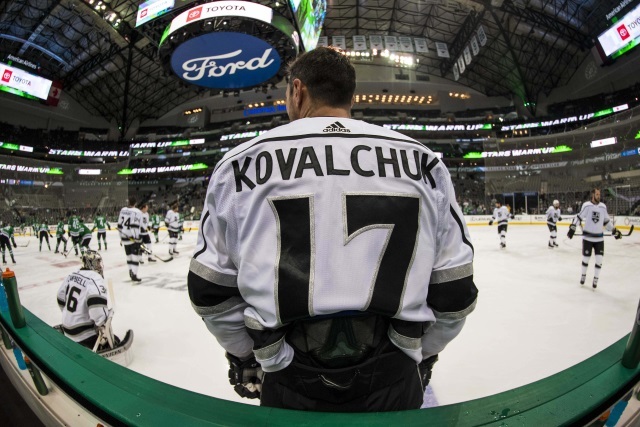 The likelihood is that Kovalchuk stays put. At least, the contract is not Jeff Carter bad. Alec Martinez — Martinez presents as an unusual case. Someone has to stay to mentor the youth. Also, the defenseman costs $4 million for another two years. That may attract some teams and dissuade others. He is 31 and would be into his mid-30’s by the end of his deal. After an awful year last season, Martinez bounced back to normal relative to possession metrics. Martinez comes with no NMC or NTC so a trade is always a possibility. Right now, it seems not so likely. A couple of cheaper sells? Brendan Leipsic — Leipsic appears out of Los Angeles by the trade deadline. On a porous Los Angeles squad, his metrics are -1.6% compared to team relatives. His ice time is sheltered at around 14 minutes — that is up 90 seconds from Vancouver. The problem is he plays on the bottom-six. He is just 24 and could be flipped easily for another draft pick that Rob Blake could use. Maybe he fetches a fifth or sixth-round selection in the 2019 NHL Draft. Jack Campbell— Cambell presents a risk but at a cheap salary of $675,000. He started 16 times for Los Angeles and has appeared in 18 contests. Unfortunately, his record stands at just 7-9. The peripherals are very good in this reclamation story, however. Campbell sports a 2.12 goals-against average with a .933 save percentage. His numbers from last year with the Kings were no fluke. Does this spur the Kings to try and get value for the backup goalie? Campbell could be nice depth for a team not looking to pay an exorbitant price. It is all about sell, sell, and more sell now. Then, there are the dead weight contracts of Dion Phaneuf, Jeff Carter, and others. Could Rob Blake package one of those in a trade deadline deal along with an asset? Again, the Los Angeles Kings and Rob Blake decide their future. What can they do? The next couple of weeks will tell the tale.